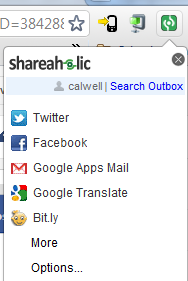 You might have been rudely surprised to find out about the new Shareaholic “Deals” integration bar. The announced feature that adds a bar to the right side of your browser when you’re using the browser extension (in Chrome anyway) gives you access to sales from savings.com. Yes, advertising. Let me show you how to disable that obtrusive feature. 1. So, open Chrome and click on the green Shareaholic icon on the top-right of your browser bar and then look for the “Options…” link. Click on that. 2. You’ll be taken to the “Services” tab, so switch to the last tab called “More Settings” as seen in the picture below. 3. The option to shut off the setting labeled “Deals”. Uncheck that and the bar will stop showing up. Now that you have some time to think, you might consider uninstalling Shareaholic. Tactics like this are not an acceptable means of monetization. Update: Be wary Shareaholic user. I found myself on American Airlines and saw the above toolbar back on! 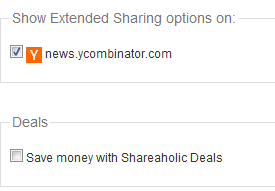 It appears as though Shareaholic turned the “Deals” bar back on without my authorization. It does get worse. You can turn it off again with the above steps, but it seems the only real way to stop this is remove the extension.